Should you go with Inmotion ? SHOULD YOU GO WITH INMOTION WEB HOSTING ? If you have decided to buy an Inmotion web hosting plan after reading above details, then, click on the below mentioned button to get latest available discounts ( These discounts can be up to 60% of total cost of the plan ). Otherwise, move ahead to next parts of this Inmotion hosting review. Before moving ahead in this Inmotion hosting review, let’s take a look at some crucial details about Inmotion. It will provide you an idea of its reputation in the global web hosting industry. Business Group – InMotion Hosting is an employee-owned and operated, domain name and web hosting company. It has hundreds of thousands of customers around the world. Inmotion’s official website receives more than 5 million monthly visits on a consistent basis. Reputed for – Affordable, feature rich, fast web hosting service and an excellent support team. In this part of Inmotion hosting review, we will first mention different positive sides of Inmotion’s web hosting service and then its negative aspects will be disclosed. Inmotion does not offer too many heavy discounts like many other web hosts. Due to this, its first year prices are a bit high (by $1 or $2 per month) . But, it does not cheat or fool the customers by raising prices highly after 1st year. Inmotion’s renewal prices for its shared hosting plans are $8.99 , $10.99 and $15.99 for all three plans. These prices are either equal to or lower than the prices of other top hosts like Bluehost, Siteground, Dreamhost, Ipage etc. Inmotion provides unlimited disk space and bandwidth in its every shared hosting plan. You are allowed to use as many resources as you want, within the practical limits of a shared hosting plan. If your website becomes too big for shared hosting, then, you will be asked to move your website to a VPS hosting plan. So, it is not truly unlimited ( every web host puts a limit ), because you can not expect a website receiving 1 million monthly visits to be hosted on a $10/month shared hosting plan. But, resources provided in these shared plans are enough for most of the small and medium sized websites. Inmotion is reputed for using top class technology and maintaining high standards of service. 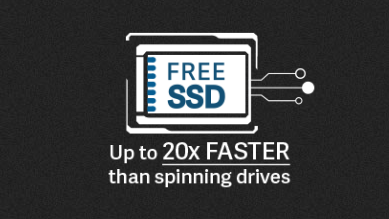 For example, it uses enterprise quality Dell servers and superfast SSD drives of Samsung. It also uses high quality power and cooling equipment in its data-centers. 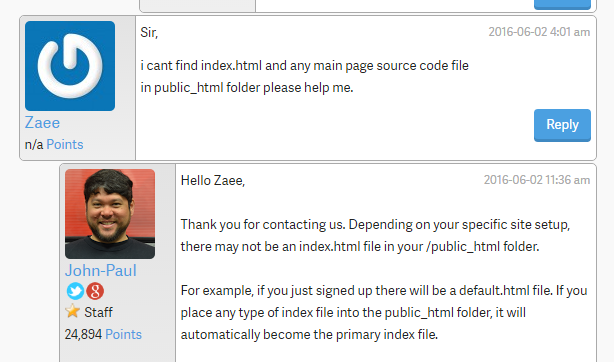 Inmotion claims to avoid overselling of its server resources. It means that Inmotion does not allow too many websites on a single shared hosting server. This allows the servers to perform smoothly, and results in a high speed and uptime record. Note – Below mentioned page loading speed refers to the initial response time of the server. Actual speeds of websites may be higher or lower depending on configuration of the website done by its owner. Speed data of our testing website hosted on Inmotion. We have a testing website hosted on Inmotion for a period of more than 4 months. We have constantly monitored its speed and uptime performance during this period. Speed of our testing website constantly remains between 400 and 500 milliseconds. It can be called truly excellent, as it is very fast by any standard. This is far better than speed of many other top hosts like Bluehost, Hostgator, Godaddy etc. which have speeds in the range of 700 ms and 1200 ms. 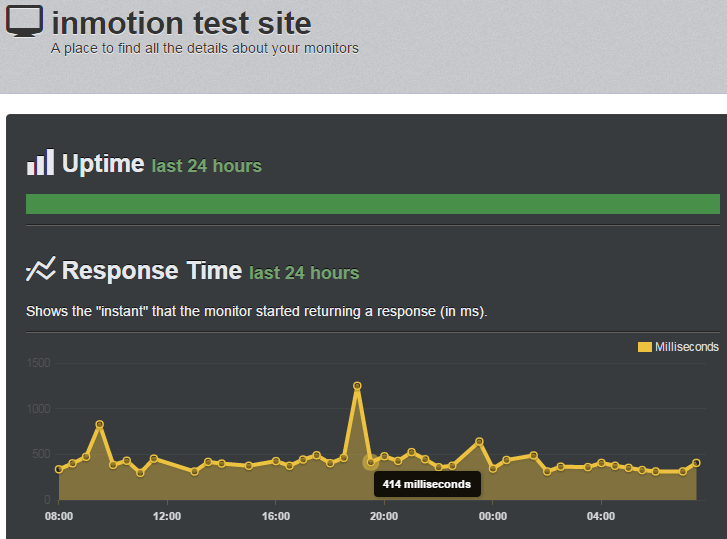 Speed and up-time data of a testing website hosted on Inmotion. Along with providing fast speed, Inmotion also provides very high uptime. During last four months, Inmotion’s testing website suffered downtime of only 4 minutes. So, its uptime was close to 100% for a long period of four months. 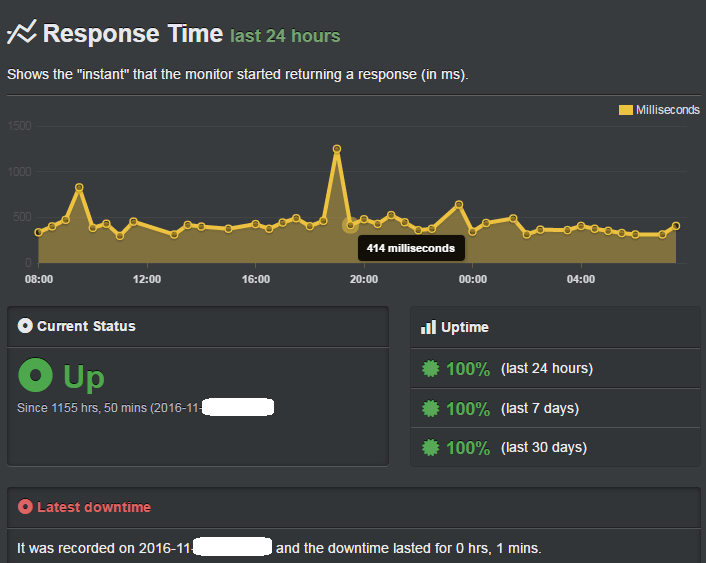 In a even longer run, its uptime remains well above 99.99%, which is truly excellent. This is well above the web hosting industry’s standard of around 99.9%. Overall, Inmotion’s performance in terms of uptime and speed is always found to be very strong. It is considerably better than its popular competitors like Bluehost, Godaddy, Hostgator, Ipage, Arvixe, A small orange, Fatcow etc. 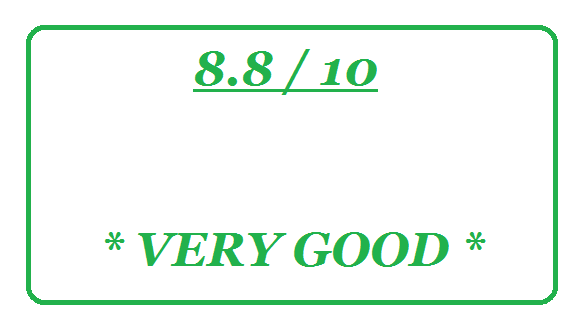 Any unbiased Inmotion hosting review will definitely praise its excellent speed and up-time record. This is one of the reasons due to which Zeniwo.com itself is hosted on Inmotion. You can confirm it by clicking here. Inmotion provides 24/7 Phone, chat and email support. I have spoken with the chat support team many times and I found them to be fast and helpful. They are very good for solving small issues. But to solve big problems, i find email support to be best. Inmotion’s email support team takes some time, but it tries hard to solve every issue. Its support team never try to ignore you or try to put the whole blame on you for your troubles. Any Inmotion customer can also ask questions through comment section of the knowledge-base. In short, Inmotion’s support staff is really fast, friendly and highly skilled. Almost every Inmotion hosting review, praise it for its excellent support system. I earlier used Godaddy for a small website, but my experience with their support staff was not great. On many occasions, they acted in an ignorant manner and tried to blame me for technical problems . But, my experience with Inmotion’s support team has been a lot better. Inmotion does very strong arrangements to secure the websites hosted on its servers. It use different tools and software to protect important passwords and to prevent any hacker from visiting the secure and restricted areas of a website. Systems are there to safeguard the IP address and to protect the images and content stored in the form of files. Any sensitive data available in the hosting accounts of customers is also protected from leakage. Inmotion’s WordPress hosting plans use Sucuri security plugin. It is a highly reputed plugin and it regularly scans a website for security risks. It also helps in protecting the website from spam and viruses. Truth is that Internet is always open to the risk of hacking, malware infection, data theft etc. , but Inmotion does its job very sincerely to protect its customers. Inmotion offers wide variety of plans from shared hosting to VPS and dedicated hosting at reasonable prices. So, even if your website grows very big and its demand of resources like Bandwidth, Disk space, Emails etc. increases, you can easily stick to Inmotion by upgrading your current plan. Inmotion’s VPS and Dedicated hosting plans can also provide good quality of speed, security, support etc. like its shared hosting plans. 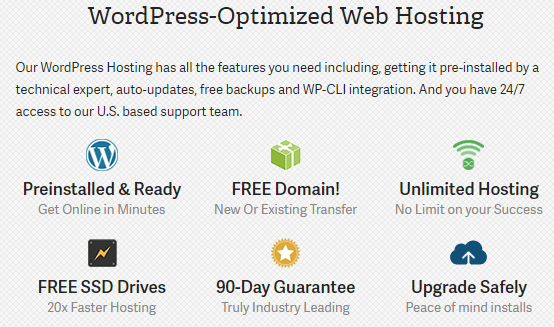 Inmotion offers 3 different wordpress shared hosting plans. These are suitable for both small websites and large websites receiving thousands of monthly visitors. WordPress comes pre-installed in all the plans. An auto installer is also available to do 1 click installation of many popular applications. I would clearly recommend you to prefer Inmotion’s wordpress hosting to the wordpress hosting provided by Bluehost, Godaddy, Hostgator, I-page, Arvixe, A small orange etc. Inmotion provides better performance and more features at relatively lower prices. I myself considered all the options mentioned above and finally decided to choose Inmotion. Inmotion provides one click installation of all major shopping carts used by e-commerce websites. It also provides SSL certificates to secure sensitive data like credit card details, which is transferred during financial transactions. High speed and up-time is very crucial for an online shop. Earlier part of this Inmotion hosting review clearly mentioned that it provides excellent speed and up-time. Overall, for small e-commerce websites, Inmotion is clearly a good choice. It is preferable to the web hosts which are slow, have poor up-time record and lack the strict security norms needed to host an e-commerce website safely and gracefully. 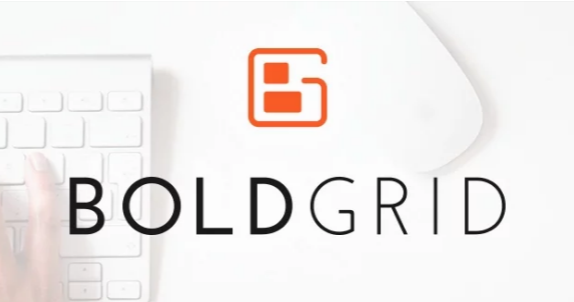 Boldgrid is a very simple and powerful website builder which is free with inmotion’s hosting plans. It is really easy to use and even someone having zero technical knowledge can use it smoothly. Boldgrid is good for creating simple designs having basic features. But, if you want something very dynamic and unique, then you will have to find another website builder. Inmotion provides C-panel which has became a kind of industry norm for Control panel. C-panel presents all the tools, files and data related to a web hosting account in a very systematic manner. You can also take a free demo of Inmotion’s control panel. Just click on the option available with C-panel icon on its shared hosting plans page, Click here for demo . 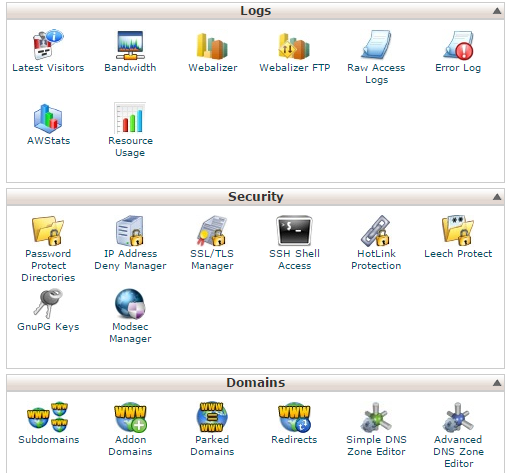 Here is a screenshot of the C-panel of my own Inmotion hosting account. Inmotion also provides free website backups on regular basis. These backups keep all the website data safe in case of a security threat or a huge technical error. After a certain limit, Inmotion charges some money to restore these backups ( this is a common practice in the hosting industry ). But, it is advisable to use some separate service to create daily website backups instead of relying on web hosts. As web hosts are not legally bound to provide you a website backup. Inmotion will refund your entire hosting cost, if you decide to cancel your plan within 90 days of creating a hosting account. This shows Inmotion’s strong confidence in its hosting quality. Allowing a high limit of 90 days for refunding the full hosting cost is not very common. Most of the web hosts allow refunds only up to 30 or 45 days. You can take advantage of this long refund period. Sign up for a hosting plan and test all the features and services provided by Inmotion. If you are unhappy or unsatisfied with the hosting quality, go, get a refund. Inmotion allows to transfer up to 3 websites from the server of another web hosts to its own servers for free. It also guarantees to avoid any kind of downtime ( time when a website is not visible on the internet ) or data loss. After 3 websites, Inmotion charges a small fees of $10 per website or hosting account. It is a very good facility, as many famous web hosts charge very high fees ranging from $50 to $150 for transferring a single website. For example, Bluehost charges a very high fees of $150 to transfer 1 website to its servers. So, in this Inmotion hosting review, low website transfer fees emerges as a very clear advantage for Inmotion’s customers . Inmotion provides many useful tools and services for free. It’s free application installer allows you to install and manage over 310 applications. These applications include Online shopping carts like PrestaShop, Open Cart, Magento etc. and some of the most popular CMS platforms like wordpress, joomla, drupal etc. Now, this part of Inmotion hosting review which mentioned the advantages of Inmotion comes to an end. From here, we will move ahead and take a look at the downsides of Inmotion’s web hosting service. Interestingly, Boldgrid gets mentioned both as a positive and negative thing in this Inmotion hosting review. Boldgrid is very good for creating simple websites having basic designs. But, you can not create dynamic, beautiful and modern looking websites with it. Most of the free website builders provided by web hosts follow the same trend. If you want advanced features like buttons, tables, accordion, slideshows, video sliders etc. then you will have to find other website builders. You can take a look at famous site builders like divi builder, visual composer, live composer, motopress etc. Inmotion provides the facility of free and automatic website backups. But it puts a limit on restoring those backups ( using those backups to get back content of the website on internet ). It provides a free backup restore once in 4 months. If you do it more frequently, then you will have to pay an amount of $49 per backup restore. This is definitely an issue, but not a very big one. Many well known web hosts do not provide even one free backup restore. Charging for restoring a backup is very common in hosting industry, though few exceptions are also there. Inmotion allows 2 websites in its smallest plan, 6 websites in its 2nd plan and unlimited websites in its largest shared hosting plan. It is a clear disadvantage, as many web hosts allow unlimited websites on all their shared hosting plans. But, Inmotion does not charge any hidden fees in the name of setup etc. to fool its customers. If you are a serious website owner, i will suggest you to spend some extra money to host more than 6 websites on the largest shared hosting plan of Inmotion. Inmotion definitely deserves extra dollars of your pocket for its superior performance. Here, this analysis of different aspects of Inmotion’s web hosting service comes to an end. In the next part, we will find out the conclusion of this entire Inmotion hosting review. Inmotion is currently providing some discount on its hosting plans. On few shared hosting plans this discount can be more than even 50%. Click on the below mentioned link to get this discount from the official website of Inmotion. Inmotion is one of the best web hosts which provide affordable shared hosting plans. Detailed analysis of Inmotion’s hosting service has been done in this review. I have looked at different pros and cons of Inmotion in an unbiased manner. Inmotion is a very good web host providing top class service at affordable prices. Let me also remind you that Zeniwo.com itself is hosted on Inmotion. On the basis of my fair observation and analysis, i also think that Inmotion is better than many popular web hosts like Godaddy, Bluehost, Hostgator, Ipage, Fatcow, Arvixe, Greengeeks, E-host etc. Here, this detailed and in-depth Inmotion hosting review comes to an end. Do you think that Inmotion can be the right web host for you ? If, yes, then use the below mentioned button to enjoy latest available discounts.